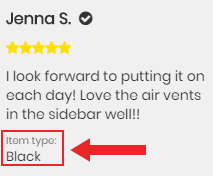 Click the "Preview & import"
After completing the import process you can head over to your product page and refresh it to see all imported reviews. Please note: AliExpress protects their customers' privacy by either censoring their name with stars or anonymizing the review by replacing the name with "Shopper" and that is how they will be imported. What does the "Import variant information (Item types)" field do? When importing from AliExpress, Loox provides the option to import AliExpress product variants that the reviewers ordered. Please note that these variants correspond with the AliExpress product that is offered and might not match the variants that you use on your store.